"Such a marvellous product, I want more people to be aware of it." I have had my wonderful HOTBIN since September 2012. Originally I got it because I live on a site with three holiday cottages and the guests would put "forbidden" cooked food/bread in the Dalek and because of that we had a few families of happy mice living there. I heard about the HOTBIN at a tourism talk in Berwick early in 2012 and thought it was the ideal answer to the vermin problem. The HOTBIN worked fairly well to begin with though I seldom managed to get it above forty degrees. After it started to give off an unpleasant aroma I decided a complete clear-out was the only answer. On my birthday my daughter came to help me - as a "birthday treat" to empty and re-fill the bin. It didn't take long to sort out the problem and we barrowed the almost ready (slightly smelly compost) to a distant Dalek where it would fester out of harm's way and kept the "needing a lot of heat" compost for a starter base after the clear-out. We cleaned out the bottom and found excess leachate and wonderful thick sludge under the perforated bottom of the bin (which I've added to my rainwater tanks for watering vegetables). We put a good few handfuls of chipped wood in the bottom of the newly emptied HOTBIN and replaced the unready compost on top and continued to add new waste. The clear-out showed two problems, a build-up of “sludge” which was preventing airflow and an excess amount of leachate. I haven't always had control over what has been put into the HOTBIN and presume now that too much wet waste was being added, so I've stopped guests putting their own waste in as the balance was wrong. I now ask guests to put their waste in a covered bucket beside the bin so that I can chop it with a spade, mix it with shredded paper and wood chips in a large bucket before feeding the "Beast" every couple of days. 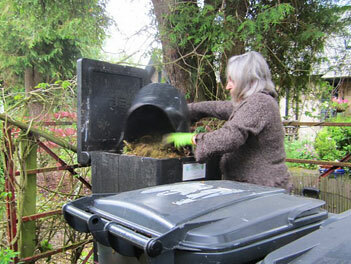 I estimate at least half of the large bucket of mixed waste goes into the HOTBIN every two days in the summer, in the winter it is a lot less as we don't have so many guests. I add grass cuttings, leaves, weeds or whatever is available to make up the bulk if necessary. 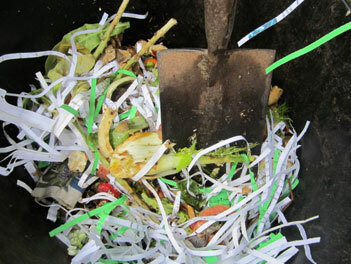 We use shredded paper from the office and chopped up hedge clippings/tree branches as necessary. Since the clear-out it's now working wonderfully, so do check you are not “sludged” up if you are having problems and had your bin for a while. The centre of the compost inside the HOTBIN is now at a constant seventy to eighty degrees and often shows just above sixty degrees on the top, it seems to sink about a foot every two days. Our guests are also really interested in the HOTBIN and at least one has bought one themselves (as have some friends of ours). The guests who purchased have chickens and use the HOTBIN for the sweepings from the henhouse - the bin runs at a very high temperature and they are delighted. We use the finished compost on all the beds throughout the site. 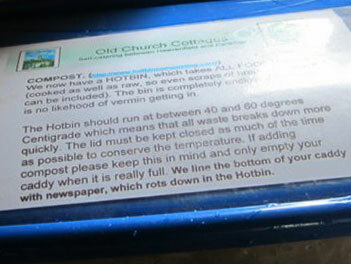 The HOTBIN is such a marvellous product and I'm so enthusiastic about it I want more people to be aware of it! Think you might be "sludged up"? Check out this post for advice. "Old Church Cottages are committed to operating under more sustainable practices and reducing waste." Marilyn Framrose owner of Old Church Cottages has had a keen interest in gardening since she was a child and has pursued her interest with the RHS as well as a course in the City and Guild's Decorative Horticulture. Old Church Cottages in Northumberland is a site consisting of 3 characterful self-catering cottages set within immaculate and peaceful gardens. Old Church Cottages are committed to minimising the environmental impact of their activities and reducing waste so operate sustainable business practices, recycle and make a positive contribution to the local community and economy. 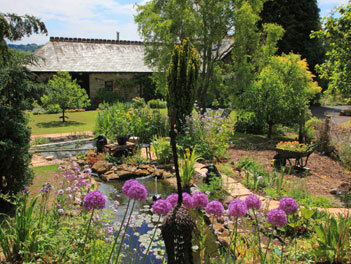 This has been recognised with a gold award from the Green Tourism Business scheme.